Conservative Member of Parliament Mark Reckless has this afternoon defected to the UK Independence Party in another surprise move by Nigel Farage’s political party. Reckless will “resign” his seat at the House of Commons and force another by-election, he has no duty to do so and admitted it was a risk as his seat “is not even within the top hundred UKIP targets”. The MP for Rochester and Stroud appeared on the stage on the last day of UKIP conference to declare that he was “leaving the Conservative Party and joining UKIP” citing problems he had experienced with the Conservative Party’s leadership, as well as disillusionment with the party’s direction in general. 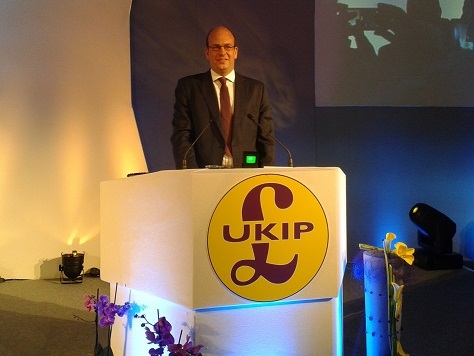 He discussed immigration and localism in front of a crowd of nearly 2000, who broke into spontaneous chants of “UKIP! UKIP!” as Reckless continued his surprise speech. Reckless went on to promise to back UKIP’s right of recall for MPs as well as a European referendum. He called David Cameron’s plans a “bogus renegotiation followed by a loaded referendum question”. The news came as a surprise to all members of the audience and journalists present, reflecting yet another coup for Nigel Farage in keeping the news utterly to himself. Mark Reckless MP added: “I don’t doubt the patriotism of conservative members but the conservative party leadership are what are holding this country back.” He claimed he could not keep his promise to control immigration as a Conservative but could as a UKIP MP. The defection marks the second MP who has moved away from the Conservative Party and joined UKIP. Last month Douglas Carswell resigned as a Member of Parliament and defected to UKIP. He will defend his seat in a by-election in Clacton on October 8th. Last month Breitbart London predicted Reckless had a 70 percent chance of defecting. Despite being a stalwart of the conservative movement for decades his euro-sceptic views had left him marginalised in Westminster. He will now be appointed as the Steward and Bailiff of the Chiltern Hundreds, this is because MPs cannot resign and instead have to be disbarred by taking a crown appointment. Douglas Carswell is the current Steward and Bailiff of the manor of Northstead, the other crown appointment used when MPs wish to leave. They will both resign these posts before polling day so they once again qualify to be MPs.